Despite a ton of action — some of it impressive, some merely clangorous — Man of Steel just didn’t feel like a Superman movie to me. It wasn’t just that Henry Cavill, the British actor who plays Superman, looks a bit like a young John Travolta — only buffed to the max. And it wasn’t that many of the touchstone events marking Clark Kent’s evolution to Superman pass without appropriate fanfare. And it wasn’t that lovable stock figures such as Daily Planet editor Perry White (Laurence Fishburne) have been drained of vitality or even that spunky Lois Lane (Amy Adams) knows Superman’s true identity from the start. They even smooch. Those things don’t help, but none of them prove fatal. But by flooding the Superman story with blockbuster-style action and by presenting it in distinctly darker hues, director Zack Snyder (Watchmen) has deprived Man of Steel of the innocence, humor and moral certainty on which Superman thrives. And by updating the series to the present day, the filmmakers are forced to abandon some of Superman’s trademark flourishes. In the age of the cell phone, Clark Kent would be hard pressed to find a phone booth in which to change into his trademark outfit, form fitting tights and a red cape. Even Superman’s suit has been rendered in a darker shade of blue than those of his predecessors, suggesting a super hero for an era consumed by global gloom. And that “S” on Superman’s chest? You might have thought it stood for Superman; it’s really a symbol of hope from his home planet, Krypton. Snyder & company treat Man of Steel as an origins story. In much of the movie, Superman is referred to as, Kal-el, the name he was given by his father Jor-el (Russell Crowe) on Krypton. This young superhero has yet to discover his destiny, which eventually will cast him as a Christ-like savior for a needy planet, providing, of course, you can imagine a savior whose battles can result in the wanton destruction of whole cites. At the movie’s end, Metropolis becomes the stage for a fierce battle between Kal-el and General Zod (Michael Shannon), a villain who escapes imprisonment, along with a handful of dedicated followers after the planet Krypton self-destructs. The planet’s core gives way, much like the center of this highly anticipated re-start. In case you think I’m exaggerating about the connection between Superman and a more widely acknowledge savior, consider this: The movie includes a scene in which a troubled Clark Kent talks to a priest. A stained-glass figure of a kneeling Jesus provides an obvious symbolic backdrop for the conversation, which takes place moments before Superman makes an appearance in his trademark cape. Perusal of the supporting cast gives you a quick idea about the way Man of Steel unfolds. Kevin Coster appears as Superman’s earthly father, the dad who doesn’t want his adopted son to reveal his powers lest the wary residents of Earth turn on him. Diane Lane — unconvincingly aged during the proceedings, plays Clark’s mother — and a group of mostly indistinguishable actors portray General Zod’s evil devotees. Zod plans to destroy humanity and reconstruct the planet Krypton on Earth, thus ensuring the survival of his race. To do this, he must tamper with the Earth’s gravity and take possession of a Codex, a device in which all the genetic codes of Krypton have been implanted. Man of Steel doesn’t skimp on action. When Superman, still a drifting Clark Kent, saves the crew of a burning oil rig, the large scaled imagery proves impressive. So do CGI images of a monster tornado that sweeps over Smallville. And for those who like pulpy views of alien planets, early depictions of Krypton may prove interesting. Of course, these also devolve into showers of fiery pyrotechnics. Making Zod the villain tends to turn Man of Steel into a second-rate space opera that’s equipped with ominous spaceships that resemble giant bugs that perhaps should have been fought with mega-blasts of Raid. A booming display of CGI dominates a protracted finale that features so much destruction, you might think that Snyder hired Michael Bay (of Transformers fame) as a consultant. There had been hope that the participation of Christopher Nolan (of Batman fame) as one of the film’s writers and producers would add a compelling contemporary sensibility to the Superman story. But looked at with the benefit of hindsight, a more serious Superman represents a major miscalculation. The same goes for the memory-trigged flashbacks that reveal Superman’s childhood. Kal-el remembers a youth in which he tried to restrain his super powers, prompting an identity crisis that pervades the movie. This Superman really is an alien on Earth. We’re all locked into our personal cultural prisons. In the case of Superman, the walls of mine were built from the comic books I read as a kid when my parents weren’t looking, from the early TV show starring George Reeves and from the better Superman movies in which Christopher Reeve found a signature role. This edition — which no doubt will smash as many box-office records as it does Metropolis skyscrapers — seems to lack deep affection for Superman. 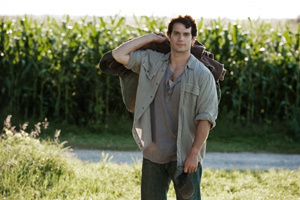 To me, Man of Steel seems more like a medium-grade summer movie than a convincing revival. I missed the character whose claim to fame involved leaping tall buildings at a single bound and moving faster than a speeding bullet. But even if you accept Snyder’s action-dominated 143 minutes, you may have have to admit that the movie might have benefited from some narrative Super Glue. Are scene-to-scene transitions a totally forgotten art? Only the movie’s final scene offers a hint of the winking chemistry that Superman needs. Yet, it too can seem weirdly misguided. Clark Kent lands a job at the Daily Planet, thus making him one of the few people in any galaxy who doesn’t know that the newspaper business is foundering. Bad career choice, Clark. Man of Steel — which offers enough action to induce motion sickness — can’t be accused of lacking an interpretive slant. (I didn’t like it, but at least it has one.) And, yes, it makes a hell of a lot of noise. What’s missing? How about a major helping of fun? How about a clear sense of yearning for the simple virtues Superman so reliably embodies? By the end of this edition, Superman not only had rocketed through Earth’s atmosphere, he’d basically flown the coop.